Summer of the Shark: Warts And All, Mostly Warts – Ya Like Dags? Some field days just don’t go well. 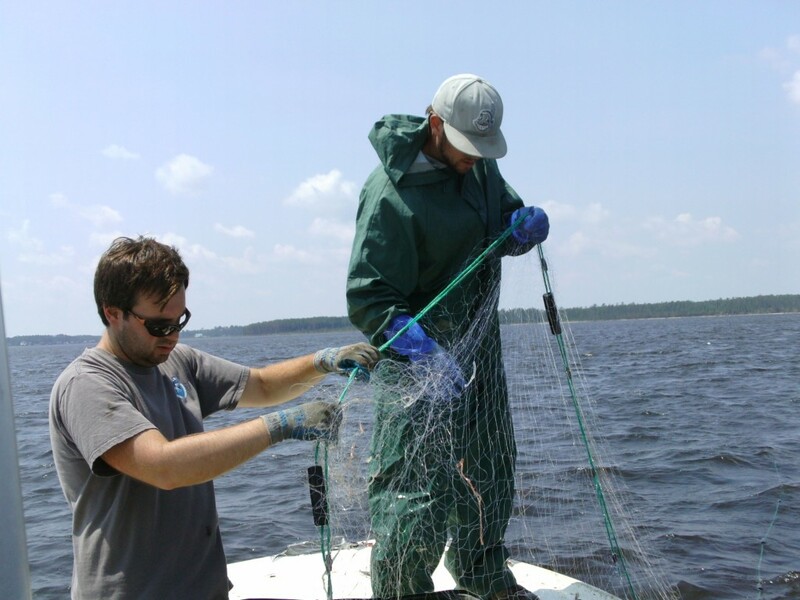 This past Thursday I went out with Evan and Jeff to do a little opportunistic shark sampling in the Pamlico River while they were out collecting water samples for a striped bass project. What actually happened was quite possibly the worst field day I have ever had, and I’ve been doing this marine biology/fisheries science thing long enough to have had a few rough field days. There was my first major research cruise, during which I puked for an entire day, and there was also the consistently inconsistent (but always pretty bad) weather during the first leg of our Cape Cod sampling last summer. This trip trumps them both, and at least partially, I only have myself to blame. When I decided a series of “warts and all” posts on my summer field work was a good idea, I had no idea how many warts there would be. At the very least this should be funny to you, dear reader. Much like my last time out in the field, this trip began with a bad omen. This time, however, that omen was a big mistake on my part, which was forgetting the mainline to the longline. Oh, I remembered the leaders, and was even excited about getting to use all of them after Jeff and I spent an afternoon disentangling them. The problem is, leaders need a line to hang from. This effectively soured my mood for the rest of the day, but at least we had the gillnet, and I was getting to play with a cool piece of equipment, a YSI Castaway CTD. 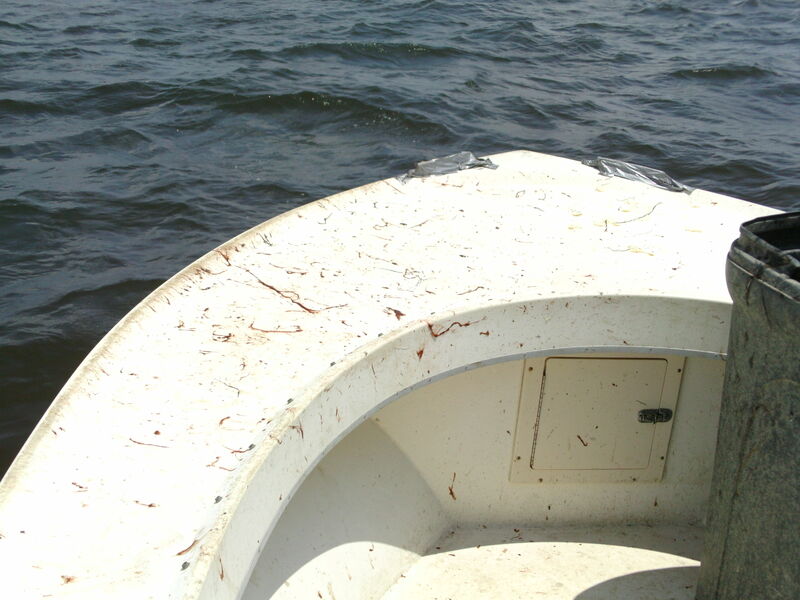 I wanted to bring the CTD because the Pamlico River is the very definition of a brackish estuary, and has a number of interesting features that affect its suitability as shark habitat. First off, the river has no true tides. There’s a little bit of tidal influence, but mostly the local water depth is a function of wind (and there was plenty of it on this day). Also, depending on the relative strength of fresh and salt water input, the Pamlico can have a very strong salt wedge, which occurs when the upper parts of the water column are a much lower salinity than the lower parts. This affects the potential shark presence in the river in two main ways: 1.) the generally lower-than-seawater salinity (around 15 ppt) means that any sharks or rays in the river will likely be the more freshwater-tolerant species, and 2.) depending on water conditions, sharks are more likely to be along the bottom than the top. The CTD, which takes water chemistry measurements througout the water column, would tell me not only what the surface and bottom salinities were, but give me an idea of where the transition from low to high salinity occurred. Plus it’s always fun to play with new toys. The Pamlico River is about as different as any of my field sites get from the Outer Banks inlets I sampled last week. The weather was a bit windy, but nothing we couldn’t handle, though we knew crossing the river would likely be a bit painful. As we deployed the gillnet, we managed to undo the nasty knot the crabs had put in it (thanks to Jeff’s considerable knot-untying skills), and it deployed about as nicely as it ever has. After we deployed, we took a look at the surrounding water, and noticed something rather disturbing: sea nettles. 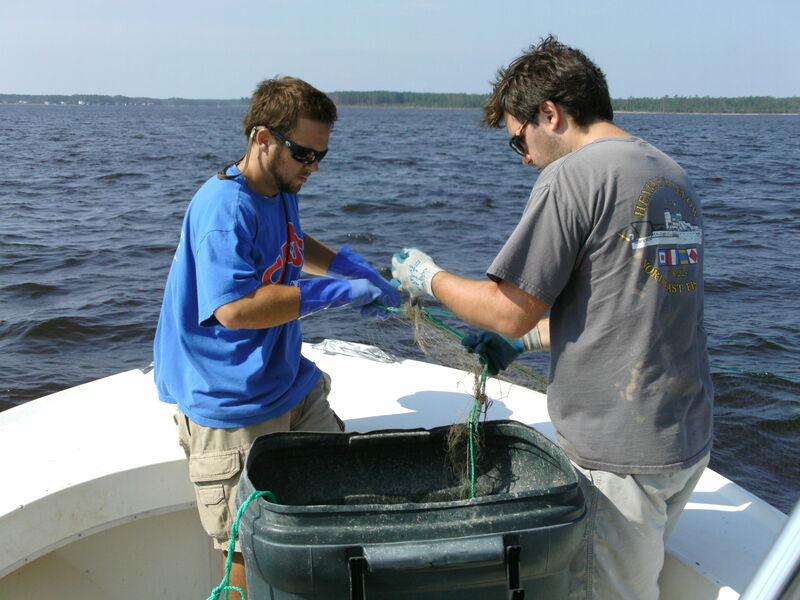 Jeff and I working out the knot and actually accomplishing a rather nice gillnet deployment. Jeff can untie knots like a boss. Sea nettles in the water. The sure sign of a good time. One of our tormentors. Despite our best efforts, about a hundred of these things made it onto the boat intact and had to be flushed off with water buckets. I fooled myself into thinking that the mesh on the gillnet was wide enough to let these jellyfish through, and that the wind-driven water would wash any remains off. I was wrong, so very, very wrong. 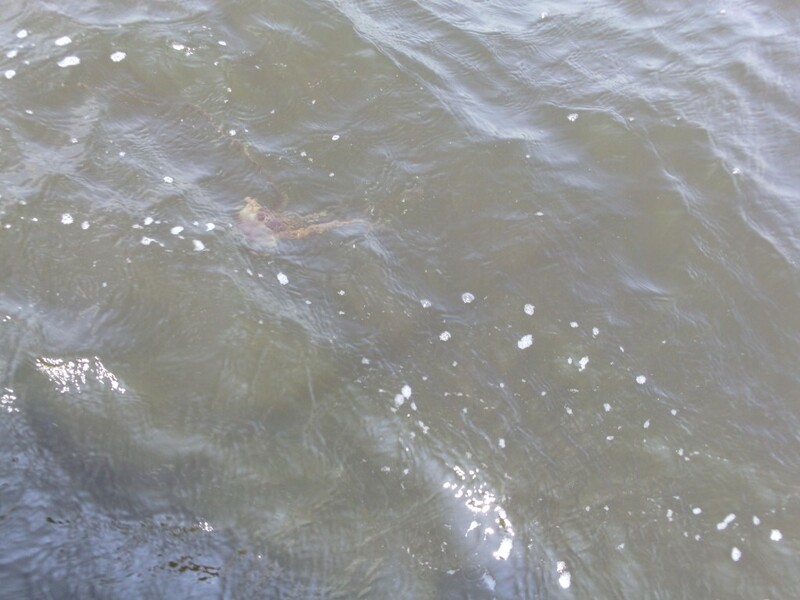 Our first set brought up a few menhaden, one crab, one harvestfish, and a disturbing number of jellyfish. Despite our attempts to shake them free, their tentacles stuck to the net like snot that burns. Jeff, and on the second set, Evan decided to court heat stroke by wearing full foul weather gear only to have tentacles blow into their faces. I decided to tough it out, since my Yankee blood means I risk heat stroke just by existing in North Carolina in the summer. There was really not good choice in this situation, so we toughed out the set and hoped for better luck on the next one. Absolute misery. My arms still had red marks on them from repeated jellyfish stings a full two days later. 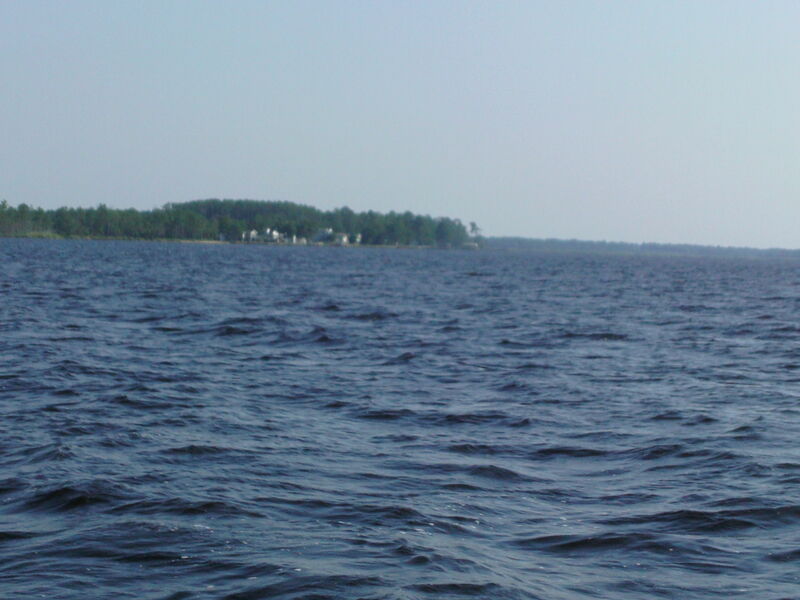 We crossed the river, which was slow, rough going in the increasing wind (the Pamlico is several miles wide where we were). The higher wind did give us hope that we had gotten out of the jellyfish, and we saw none as we deployed the second set. The gillnet deployed beautifully on the second set, so at the very least we have that down (though still not as fast as the longline). We waited the half-hour soak time, started pulling the gear… and immediately started seeing red tentacles. This set was an absolute jellyfish massacre, and by that I mean the jellyfish massacred us. I suppose I should count us lucky that sea nettles are merely irritating and not actually lethal, but by about halfway through pulling the net I started wondering if it would really be so bad if they were. Even better, the wind was sending the tentacles flying everywhere, including one that managed to get under my sunglasses and almost into my eye. Gillnetting in sea nettle waters is not for the faint of heart. No, this is not a murder scene. Those are all sea nettle tentacles. If we were part of a fishery targeting pain, we would have been rich men from this haul. 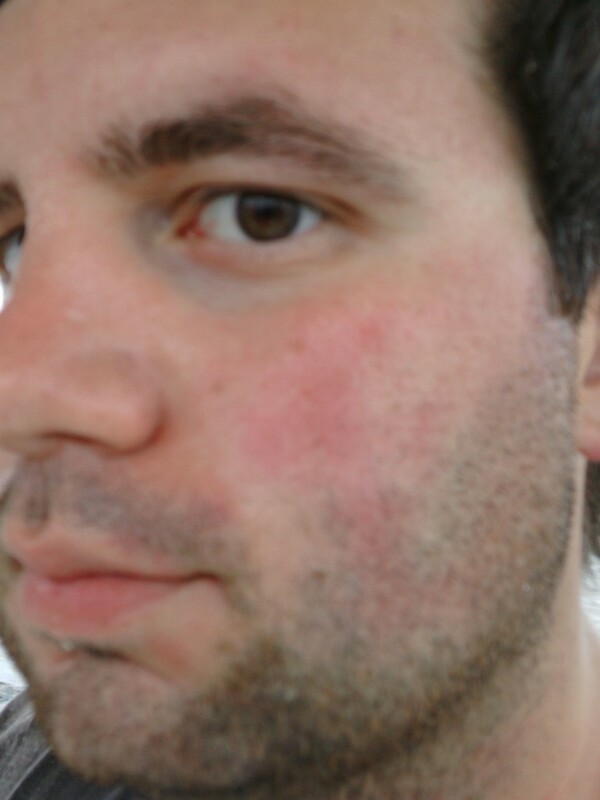 The red mark on my face is courtesy of the jellyfish that made a one in a million shot around my sunglasses. No, it did not feel great. After the second set, we decided that between the jellyfish and the increasingly strong wind, it was time to bag the gillnet for the day. So what did I learn from all this? First: don’t forget one of the gears, so that when you get into a situation where the gillnet is practically unusable, you can at least use the longline. Second: invest in light foul weather gear. The stuff we had available is used by New England fishermen working offshore, and way too warm for a 93 degree day in the sun. 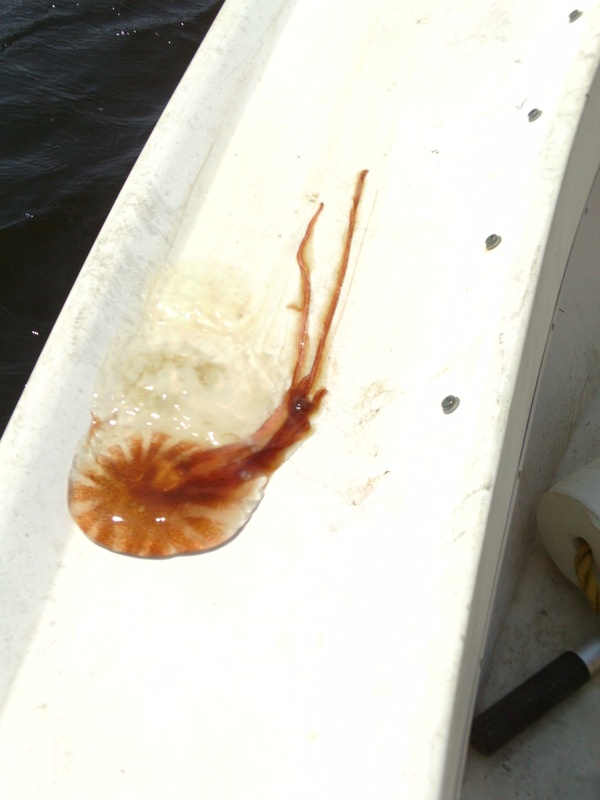 Third: the jellyfish load in the lower Pamlico River is no joke, and might make sampling there a longline-only endeavor during the summer as this project expands. The silver linings: we’ve got the gillnet deployment down pretty well, working up a net full of jellyfish is still faster than one full of crabs, and some interesting habitat data was gotten using the CTD. This is an interesting environment, and we do get a lot of reports from fishermen and other surveyors about juvenile bull sharks in the area, so the Pamlico River remains a site of interest, even if this time all we found there was pain. There are sharks somewhere in there, but a gillnet full of jellyfish isn’t going to find them. The next trip will likely involve us trying to get revenge on the Pamlico by longlining the hell out of it. Pingback: Summer of the Shark: Back to the Pamlico | Ya Like Dags?